Choosing paper can be daunting as it has a bewildering array of types, weight and finishes to choose from. So which is best suited to your project? Before you delve into the varieties of paper types, there are a few things you should know. All paper types can be divided into two basic broad categories; coated and uncoated. Coating creates paper with great ink holdout, making it the ideal choice for colour reproduction. The paper is coated with an agent to enhance brightness. The coating fills the pits between the fibres in the base paper giving it a smooth, flat surface. This can improve the opacity, lustre and colour absorption ability. 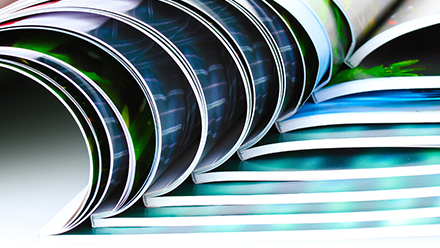 Coated paper is a popular choice for glossy artwork in brochures, menus and leaflets. Coated papers have fantastic runnability and printability. They offer a consistently high quality surface, stiffness, bulk and opacity. This is due to the fact that coated papers are more calendared. This means the paper is flattened more, making sheets thinner than uncoated paper. Uncoated paper is the most common form of paper. It is ideal for use in laser printers and photocopiers. This is the preferred paper type for business stationery. It is also a popular choice amongst companies who want to give a natural feel to their printed material. This is due to its slightly grainy texture. Uncoated papers are generally more porous than coated papers. They are available in many different textures, colours, weights and finishes. When printed on, the ink is absorbed into the paper. This characteristic means images printed on uncoated stock are softer and warmer; less crisp and defined. Once printing is complete, uncoated papers take much longer to dry. This subtle, understated quality of printing on uncoated paper is the ideal choice for high quality print work where a more approachable appearance is desirable. If you have a full colour document rich with photographs or illustrations, you’ll get the most vibrant colours if you opt for a coated paper. Whether you choose a gloss, silk or matte finish comes down to personal preference or may be led by the desired finish you want to achieve. Ask your printer to supply samples of different papers and finishes so you have a clear idea of how each combination will look. While uncoated paper can be used for full colour projects, the colours tend to be less vibrant and produce a natural, refined look. If your document is designed to be written on, uncoated paper will be the best option. This is why uncoated paper is the preferred paper type for business stationery. When choosing coated or uncoated papers, talk to us at Lemon Press about the desired effect you want to achieve with your print work. Think in terms of crispness and warmth, subtlety and vibrancy and economy and style. We can guide you in selecting just the right combination of inks, paper textures, finish and coatings and print techniques that make your print job do exactly what you want it to.